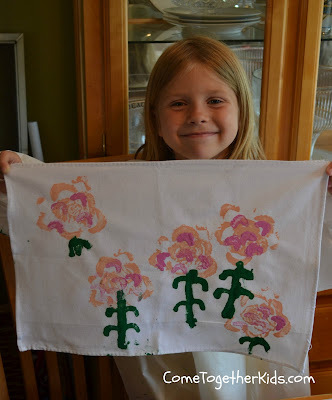 This quick little post has nothing to do with crafts, projects, or recipes. However, I think it falls in the category of "too sweet not to share", so I'm sharing it! This week the kids and I are visiting their grandparents, aunts, uncles and cousins. We live about an hour and a half away from my family, so while we see each other several times a year for birthdays and holidays, it's really only during this week each Summer that we can really spend a good chunk of time together. We've been having a blast as the first cousins (all 8 of them!) go to a Vacation Bible School together in the mornings, then play together in the afternoons and have sleepovers nearly every evening. Today, several of the cousins were walking around my parents' yard when they spotted a dead baby bird on the ground. Its nest must have been blown out of a nearby tree. They quickly called my Dad over and "PopPop" discreetly disposed of it. Although the kids were accepting of this fact of nature, and understood the dangers of being a tiny baby bird on a windy day, they quickly decided the bird needed some kind of memorial. 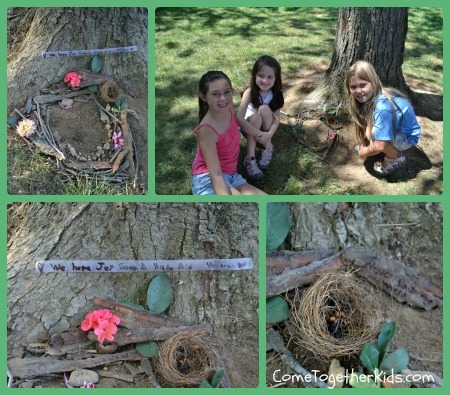 The kids began collecting little rocks, sticks and flowers and began arranging them into a little memorial for the bird they'd named "Jet" (after one of the characters at their Bible camp). NOTE: The actual dead bird had already been discreetly disposed of in the trash. The adults stayed back as the kids busied themselves for close to an hour. I admired how they accepted the death (granted the baby bird was a "stranger" not a pet), but wanted to pay their respects nonetheless.
" In Loving Memory of Jet"
" We hope Jet Goes to Baby Bird Heaven"
" We Love you Jet"
I'm so glad we're here enjoying the week with our extended family and also how in this unstructured time together I get another chance to see just how sweet the kids can be. The 4th of July festivities here in the U.S. are just a week away. 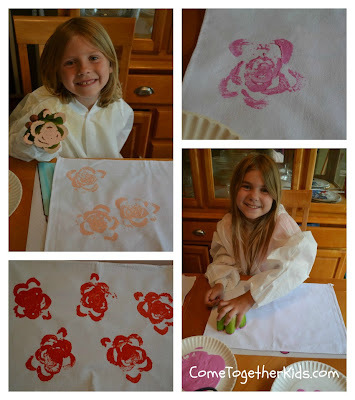 Since it's the perfect, middle-of-summer reason for some fun crafts and tasty treats, I went to our awesome Summer Fun Party themed collection in search of some great patriotic ideas. try out this cool technique. Don't the paint splatters look just like fireworks? have spinning some fun designs. some sort of stick or straw. were both made from a single sheet of paper. We'll definitely be making some of these. and these red, white & blue layers look awesome. 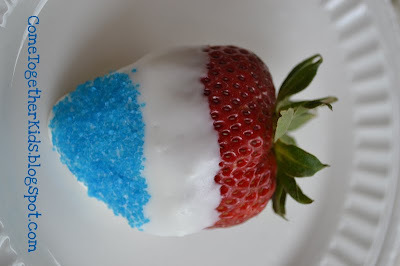 using Jello to make a patriotic treat. you can make colored, flavored popcorn. Weren't they awesome? I can't wait to give them all a try for the 4th of July next week (or for any other Patriotic Holiday). As I mentioned, I collected all of these ideas from among the almost 250 amazing links at our Summer Fun Party. 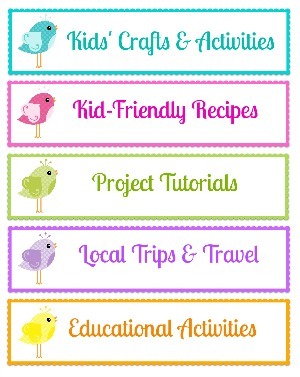 Check it out if you are looking for some inspiration for kid-friendly fun! Oh, and even though the title of this post is "5" Fun Ideas, I'm throwing in two more bonus ideas of our own. It's amazing how much presentation is the key. are just so much more special! but looked so festive and fun. as your serving of fruit for the day! 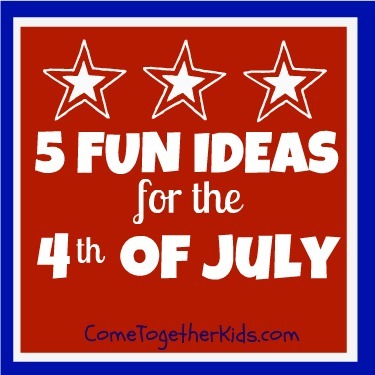 I hope you found some fun ideas in this post and I hope you have a happy and safe Fourth of July! 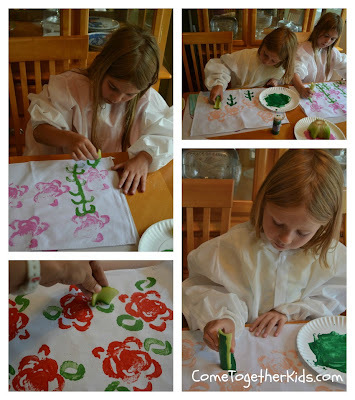 This yet an another awesome idea I got from Erin at Making Memories with your Kids. 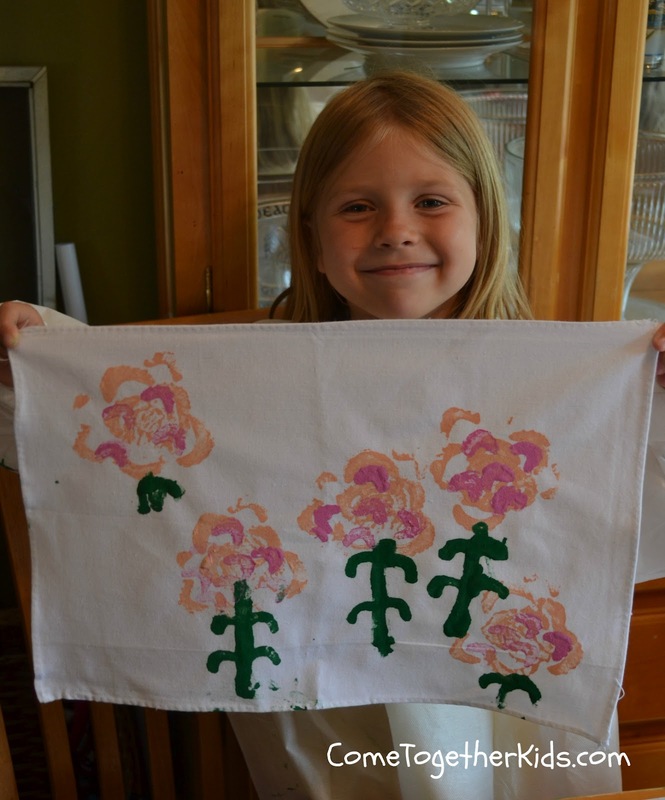 She is just amazing and comes up with the best fun activities and ideas. As soon as I saw her post about The Perfect Way to Give Money , I knew I'd be using that fun idea as soon as I could. 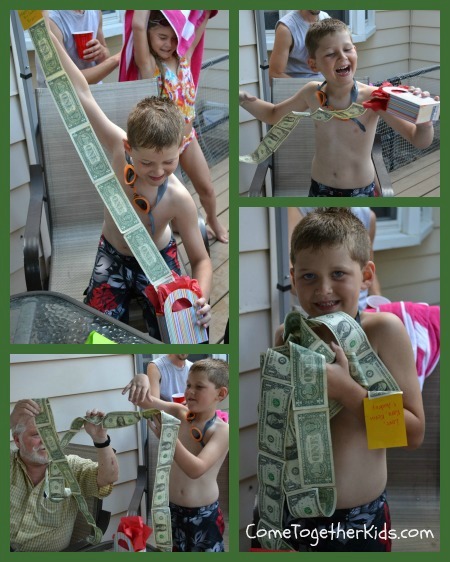 Well, my nephew's 7th birthday party was this weekend and I knew it would such a fun gift for him. I changed the container I used, but I kept the concept the same ~ pull on a little tab and a whole string of bills comes out! It was so simple to make and it was a huge hit when I gave it to my nephew. 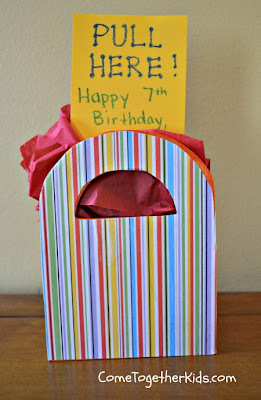 I decorated a little wooden gift bag container I found at the craft store, but you could use a container like Erin did or even a regular gift bag or small box. 1. 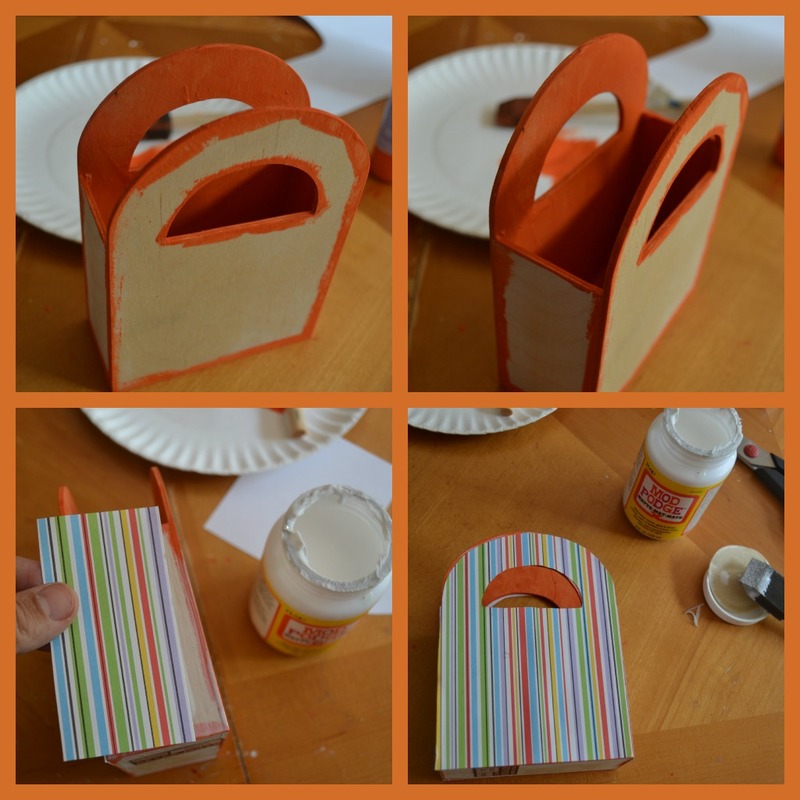 I gathered my supplies ~ the plain wooden gift bag box from Michaels, Mod Podge and some scrapbook paper. 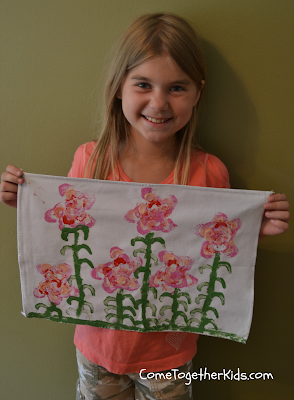 I also used some acrylic paint and some tissue paper (not pictured). 2. Next, I painted the inside of the box and the edges with some acrylic paint. I traced the four sides of the box on to the paper, cut it out and ModPodged it onto the box. 3. I cut a coordinating piece of scrapbook paper slightly longer than the top opening of the box, and cut a slit in it large enough for a dollar bill to fit through. I then taped one side of it to the top of the box, leaving the other side untaped so I could put the money in. 4. Next, it was time to tape those bills together. I just used a bit of clear scotch tape on each one. Since each bill is about 6 inches long, you end up with a nice long string of bills to pull out! 5. All you have to do now is roll up your string of bills and put them in your little container. Thread your first bill through the top slot and tape down the other side of the paper across the top. 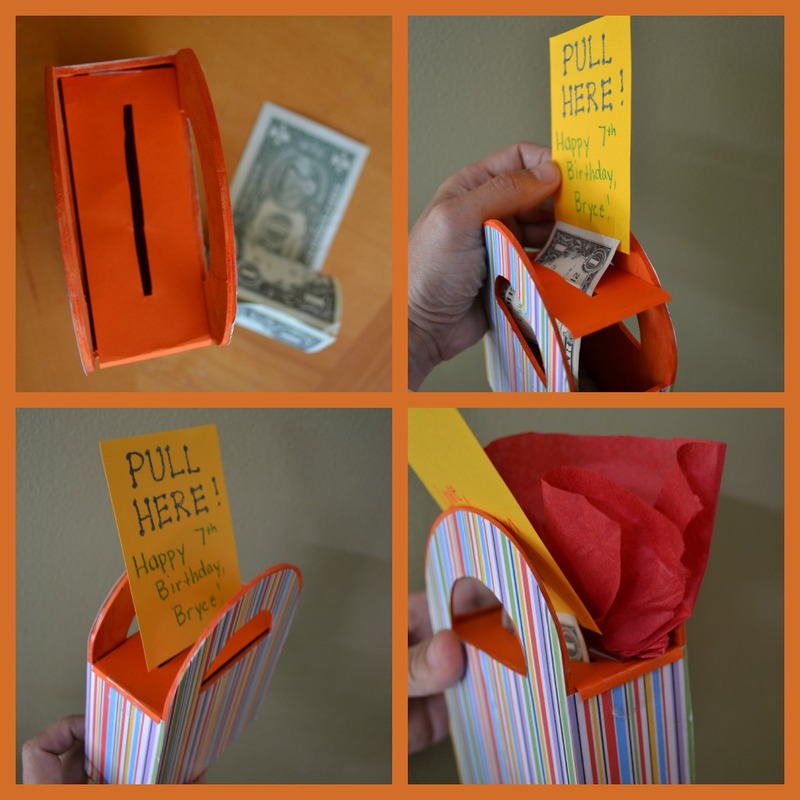 I made a little "PULL HERE" Happy Birthday tab slightly larger than the opening and attached it to the top bill so the starting piece wouldn't slip back into the container. Finally, I taped on just a little bit of tissue paper around the top so you couldn't see the start of the bills inside. That's it, your cash is ready to give as a gift! Want to see the gift-receiving in action? Check out the face of this surprised and happy 7 year old! 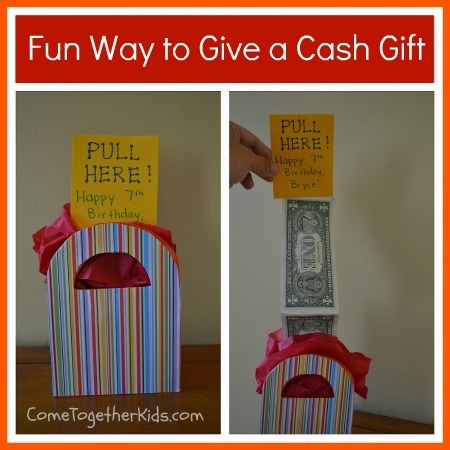 Oh, and if you want another cash-related birthday idea, check out this Birthday Balloon Pop tradition I've started with my kids ~ so much fun! When I posted our Jello Watermelons the other day, I promised an easy recipe for a refreshing drink using the actual watermelon that I scooped out. Well here it is! You only need two ingredients (watermelon and lemonade, duh!) and you can whip up just a glass or a whole pitcher. 1. Using your favorite lemonade mix, make some double strength lemonade. (So, if the directions call for 1/4 cup powder, make it 1/2 cup instead but use the same amount of water. Or if it's frozen concentrate, and it calls for mixing it with 3 cans of water, only use 1 1/2). Pour your strong lemonade into ice cube trays and freeze. You'll also need some watermelon, so cut up your watermelon into chunks. (This is a perfect way to use up some of those end slices or the extra watermelon that you have when you use a melon baller). You'll want your watermelon chilled, so either keep it refrigerated, or pop it into the freezer for a few minutes if it's room temperature. 2. 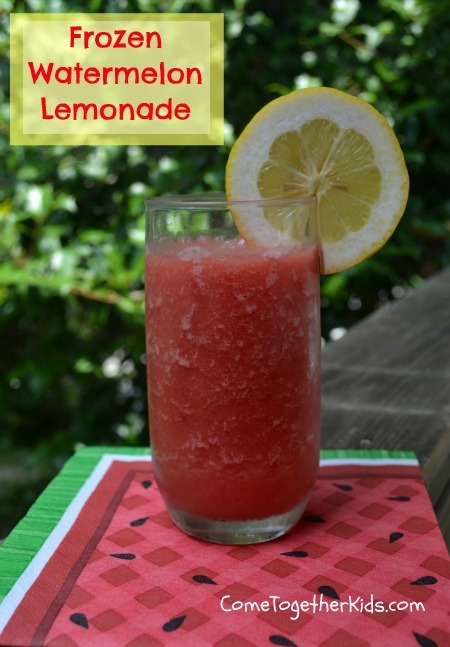 Once your lemonade is frozen and your watermelon cut up and chilled, put your watermelon in the blender and blend until liquified. You'll find that once blended, you have about half as much. I typically blend up about 4 cups of watermelon at a time and end up with a little more than 2 cups worth of watermelon lemonade. 3. Now that you have your watermelon all blended, add some lemonade ice cubes and blend some more. The amount you add is up to you. The more ice cubes you use, the thicker your frozen drink will be. I usually add 6-8 and it's drinkable with a straw, 10+ and I can eat it with a spoon. That's all there is to it! It's best to drink your frozen lemonade shortly after making it. The watermelon pulp gets blended in with the frozen lemonade, so it's all nicely mixed together. However, if you let it settle too long, the pulp will rise to the top and the liquid lemonade will settle to the bottom. Also, we like the how these have just a hint of the lemonade flavor. You could also make your lemonade even stronger before freezing if you decide you want more of a lemony taste. Hope you enjoy it. We've made it several times already this summer and the kids love it every time. I love that there's hardly any work to it. I keep the lemonade ice cubes ready to go in the freezer, so whenever I have some extra watermelon I can whip up a batch in just a few minutes. I've been wanting to make jello like this for ages now. 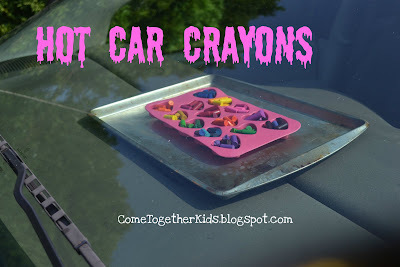 In fact, I first bookmarked this awesome idea from Gourmet Mom on-the-go way back in 2009. (just the fact that I bookmarked it instead of pinning it tells you it's been in my to-do files for awhile!). Anyway, I finally had all the ingredients on hand and made some for the kids. They loved it ~ and I thought they were pretty neat too. 1. I got a small watermelon and a few boxes of cherry jello (the larger 6oz size). 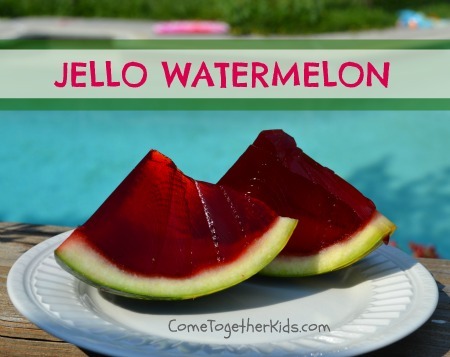 NOTE: I just used three boxes of jello, but if you're making this for a crowd or you have a big watermelon, you'll need a lot more. 3. Prepare your jello liquid. You'll basically be using the recipe for Jello jigglers, so use 1 1/4 cups boiling water for every 6oz package of Jello. I was only able to fill one half of my small watermelon with my 3 boxes.. To figure out how many boxes you'll need, you can pour regular water into your watermelon shell to see how much it holds, then divide by 1.25. (So, for example, if your large watermelon holds 10 cups of water, divide 10 by 1.25 and you'll need 8 boxes of Jello). See, you can tell your kids you really do need Math in real life! I placed my watermelon shell in an empty bowl to hold it steady, then poured in the liquid. 4. Refrigerate for several hours until the Jello sets. The total time will depend on the size of your watermelon, my small one took about 4 hours. 5. Slice just like you would a regular watermelon and serve! I made these while my kids were at VBS and they were in awe when I sliced it and handed it to them. 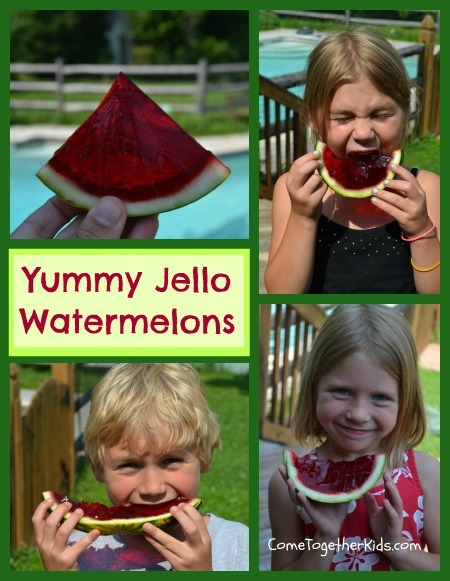 They just couldn't figure out at first how I got the Jello to replace the watermelon. I really liked that because it was like a Jello jiggler, you could totally hold it just like a slice of real watermelon and the Jello stayed in place. NOTE: The original post added mini chocolate chips when the jello was just barely set to look like watermelon seeds. Since I'm not a big fan of the taste of fruit and chocolate together, I left it out. However, if you like that flavor combination, just use a chopstick to push in the mini chocolate chips when the Jello mixture is soft set. Like much of the country, we're in the middle of a heat wave here. With temps in the high 90's and heat indexes that are even hotter, you need to find some fun ways to keep cool (or at least make the most of the hot temperatures!) Here are a few fun ideas from past posts that might help. 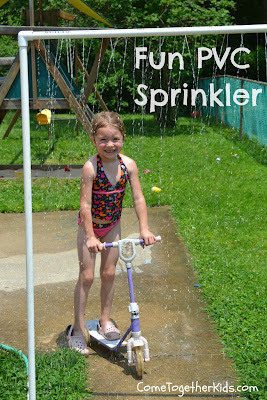 Your kids will LOVE playing with this sprinkler. They can even ride their bikes or scooters through it. Plus, it's surprisingly inexpensive and easy to make. and it only took about 30 minutes. on the dashboard of our van! never leave kids or pets in a hot car. 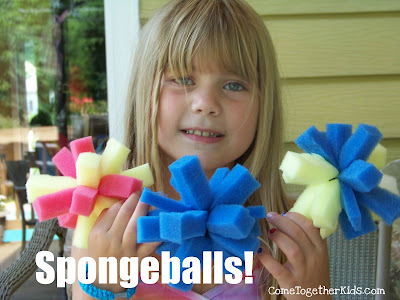 and make a bunch of these spongeballs. and let the splashy ball tossing begin! when the temperatures are soaring. You don't need rock salt or an ice cream maker. You don't even need cream or sugar. and a food processor or blender! It's really easy and super tasty! 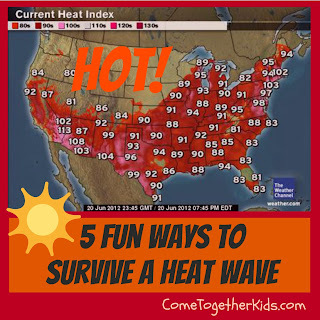 Well, there you go, five fun ideas to make your next heat wave a little more tolerable. 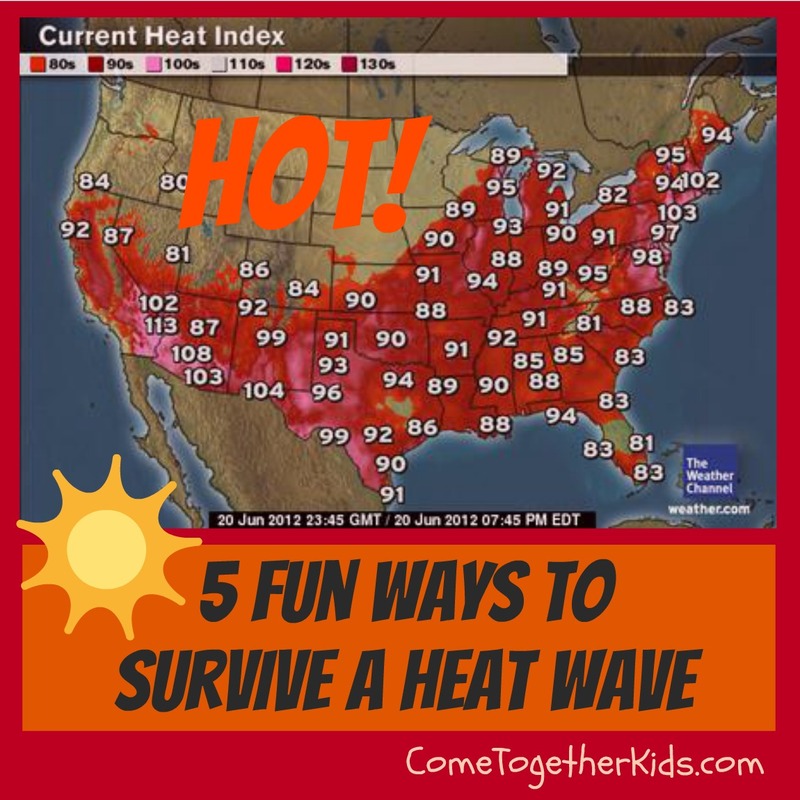 I can't promise that these ideas will eliminate all of the heat-related whining (because nothing seems to stop that here!) but at least it might help bring a few smiles to those hot sweaty faces! How about you? Do you have other tricks, tips or treats for these super hot days? 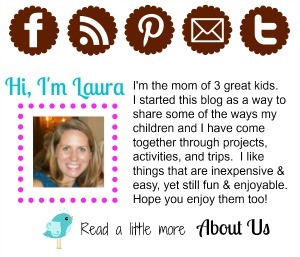 I'm really excited to be sharing my blog this summer with several fabulous guest hosts. 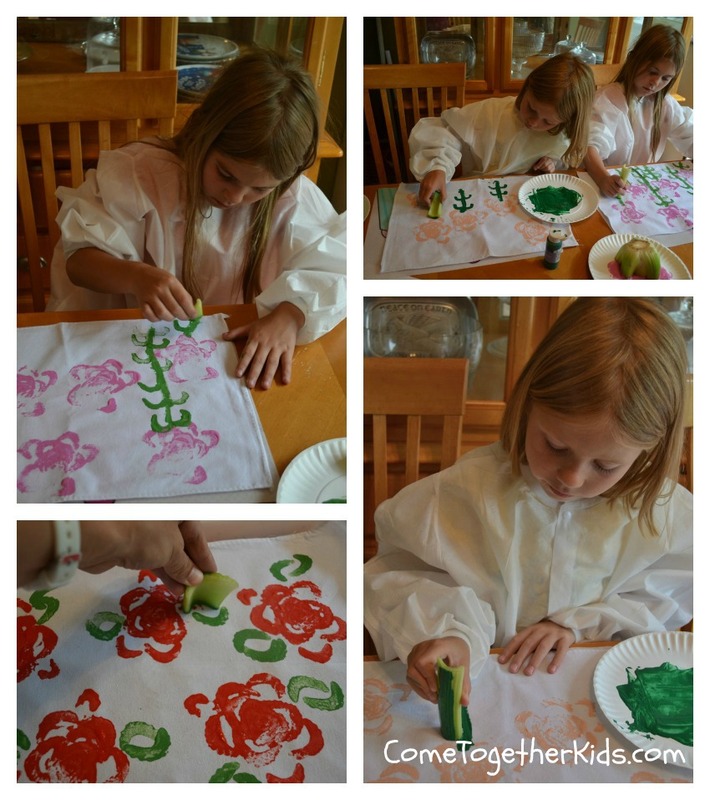 About once a week, you'll be treated to a fellow blogger sharing some of the ways they've come together with their own kids. 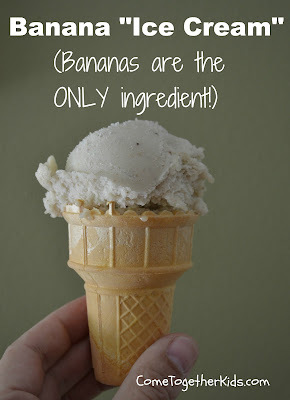 I'm thrilled to introduce our first guest post with an awesome idea for a frozen summer treat. 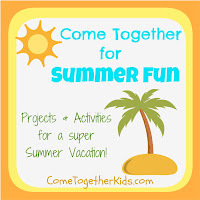 I am thrilled to be guest posting here on Come Together Kids today. My name is Deirdre Smith and I am visiting from my blog JDaniel4’s Mom. 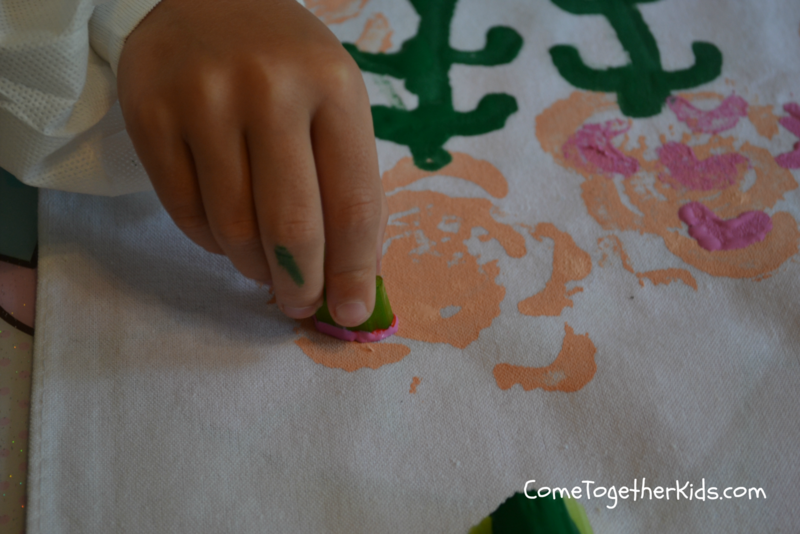 My blog is about raising my four year old son, the adventures we have, the special meals we create, the crafts we make, and the learning we do. 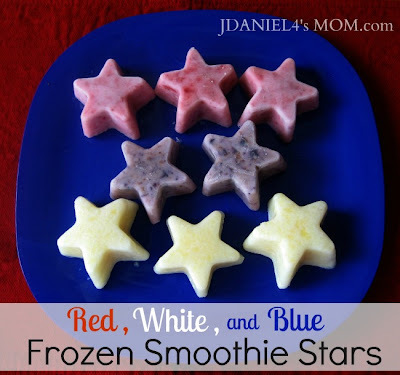 With the 4th of July right around the corner I thought I would share with you strawberry, blueberry, and vanilla pineapple smoothie stars. 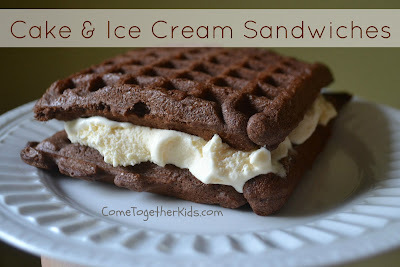 They would be wonderful dessert to pull out for guests attending a 4th of July picnic or playgroup gathering treat for both moms and kids. Our smoothies are made of three basic ingredients. We start with a cup of frozen fresh or frozen canned fruit in the blender. Then we add ¾ of cup of liquid to the blender. The liquid maybe milk or fruit juice. Finally we add a small carton of fruit flavored low fat yogurt. After blending all the ingredients, we poured the mixture in to a silicone cupcake or muffin tin. For this project we used one that has a star shape. The tin is placed into the freezer for a couple of hours until the smoothie mixture has hardened. 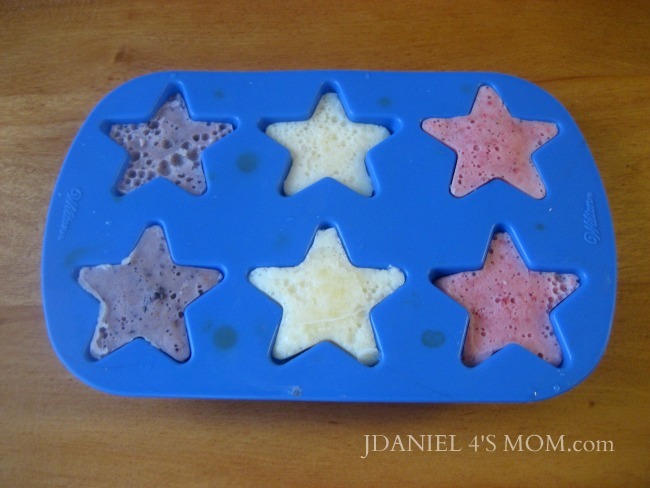 When frozen smoothie stars are ready, we just popped them right out of the tin. The silicone tin is really flexible and you can just push the back of each of its cups and the stars come right out. The smoothie stars were extremely solid when we took them out of the tin. They had to sit out on serving plate for a few minutes before we could eat them. If you like smoothies, you will just love these. 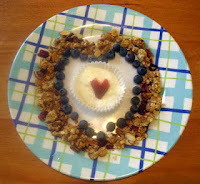 If you like cooking with your children, here are a few other recipes JDaniel and I have tried together. 1. First, gather your supplies. You'll need a stalk of celery and some paints. We did our celery prints on some plain white placemats, but you could also do them on paper, a tote bag, a t-shirt, etc. 2. Carefully make a straight cut across the bottom of your celery stalk. It totally looks like a flower, doesn't it? 3. 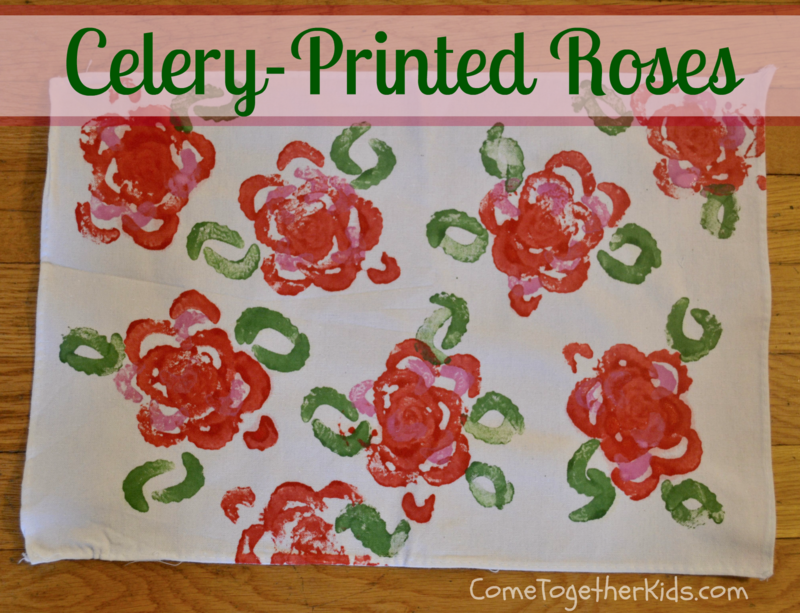 Next, use your celery stump to start printing some flowers. We dabbed it onto a paper towel to remove any excess moisture, poured some paint onto a paper plate, did a couple test stamps, then got to work. 4. Then, use the ends of some of the celery sticks to add some leaves or stems to your flowers. I opted for leaves only, the girls made a whole stem with leaves. That's it! So cute aren't they? 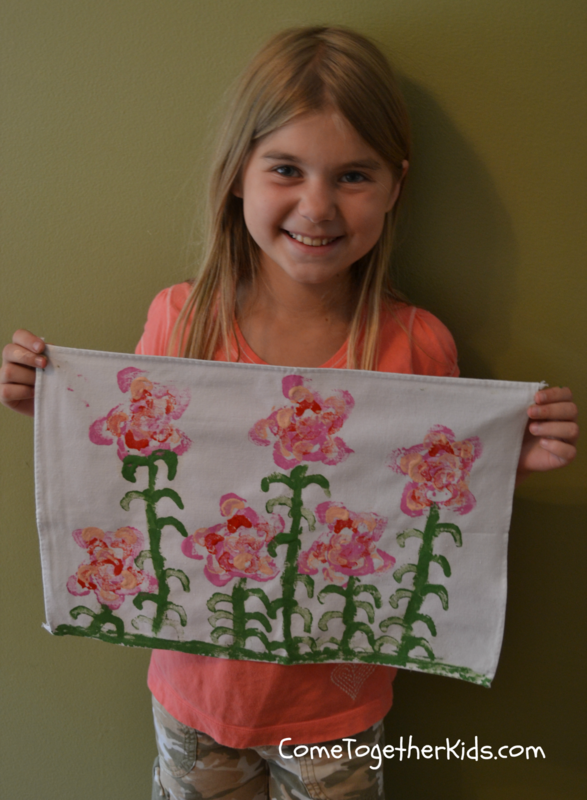 I think they really look like roses, or perhaps peonies, but definitely pretty flowers! My son politely declined to make one himself, but he said he'd use the one I made the next time we set the table with them!